The use of particle accelerators is not confined to basic research in high-energy physics. Large-scale accelerators and gigantic instruments such as the Large Hadron Collider (LHC) are used for this purpose, but relatively small accelerators are used in medicine (diagnostic imaging, cancer treatment), industry (food sterilization, cargo scanning, electronic engineering), and various types of investigation (oil prospecting, archaeological surveying, analysis of artworks). Whatever the use, controlling chaos and boosting particle flow efficiency are the goals of the scientific community in this field. 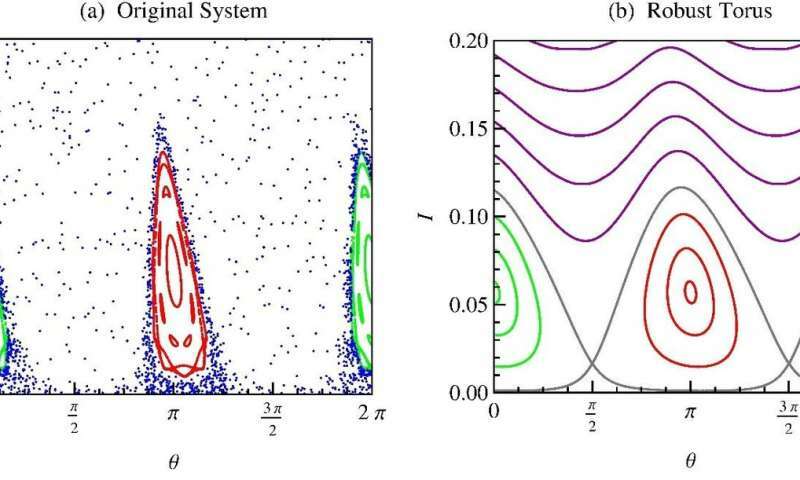 A paper describing a new contribution in this direction has recently been published in the journal Physics of Plasmas by Meirielen Caetano de Sousa, a postdoctoral student with a scholarship from São Paulo Research Foundation—FAPESP working at the University of São Paulo's Physics Institute (IF-USP) in Brazil, and her supervisor Iberê Luiz Caldas, Full Professor at IF-USP. "We performed a theoretical study with modeling and numerical simulation to investigate ways of controlling chaos inside accelerators and increasing the maximum velocity of accelerated particles," Sousa said. The authors designed a mechanism based on the deployment of a transport barrier to confine the particles and prevent them from moving from one region of the accelerator to another. This procedure has not yet been implemented in ordinary accelerators but is used in tokamaks (experimental toroidal reactors used in nuclear fusion research), where superheated plasma is prevented by particle confinement from interacting with the walls of the device. "In tokamaks, the transport barrier is obtained by means of electrodes inserted into the plasma edge to alter the electric field. This hasn't yet been done in accelerators, where the usual solution is to add an electrostatic wave with well-defined parameters to the system," said the researcher. "When the wave interacts with the particles, it controls chaos in the system but creates multiple barriers that don't seal the region as precisely. This is a less robust solution. In our study, we modeled a system with a single barrier along similar lines to what happens in tokamaks." This single robust barrier would be produced by a resonant magnetic perturbation. In responding to the RMP, the plasma is confined to a single region. "We created the model and described it mathematically. The numerical simulations showed that it works. 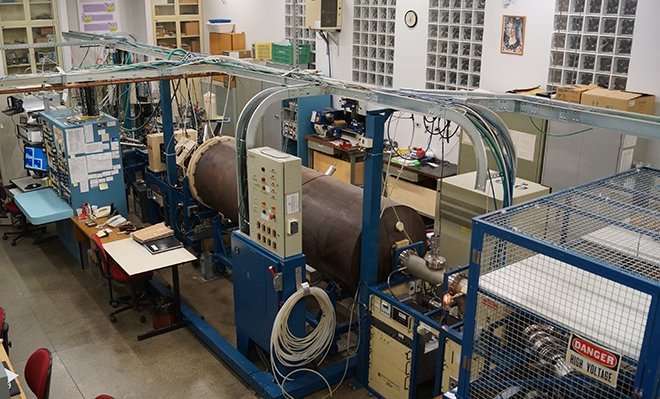 The next step is to take the proposal to experimental physicists who can test it in practice," Sousa said. The particles are generated by an electron gun owing to the difference in potential between the anode and cathode or by applying a laser pulse to the plasma. They are accelerated by successive injections of energy from electromagnetic waves. Interaction between the waves and particles creates chaos. A solution tested experimentally in accelerators consists of adding another wave with parameters adjusted to offset the chaotic process. "This was discussed in a previous article published in 2012 in Physical Review E . The method works, but as noted, it creates multiple transport barriers that are susceptible to perturbation, making particle confinement less effective. In this latest study, we modeled a solution based on a single robust barrier, which continues to exist even in the presence of high perturbations," Sousa said. The transport barrier controls chaos, allowing maximum particle velocity to increase and reducing the requisite initial velocity. For a low-amplitude wave, the simulated final velocity rose 7 percent, and the initial velocity fell 73 percent. For a wave of higher amplitude, the system proved chaotic without the barrier but was regularized with the barrier. The final velocity rose 3 percent, and the initial velocity fell approximately 98 percent. This shows that the transport barrier's main contribution is a reduction in the initial velocity required for the particles when they are injected into the accelerator. "What's expected of an accelerator is that all particles arrive together at the end without going astray en route, and with more or less the same energy and velocity. If they behave chaotically, that doesn't happen, and the beam is of no use for any application," Caldas said. "Particle emission for medical or industrial use is still based mostly on the use of radioactive materials. This causes a number of problems, such as pollution, decay of the emitter material requiring replenishment, and high cost. Accelerators avoid these problems and are a partial substitute for radioisotopes. Hence the strong interest in optimization of accelerator functioning," said the FAPESP grant supervisor.